Feel an explosion of ecstasy when you trip on the Dynamite truffles. This strain of truffles produces very strong, sharp hallucinogenic effects and increases your overall sense of wellbeing. The Dynamite truffle allows you to feel invincible while under its effects, which last from 4-6 hours. The perfect truffle for experienced tripper who want to dive into a world of bright colors. Strong Visuals and Colors. This truffle pack will allow you to experience colors in a different way. See the entire spectrum of colors with the Dynamite. Intense Feeling of Confidence. Not only does this magic truffle strain have an intense visual side, the effects on your feelings are strong too. Feel empowered and emboldened. Happy and Fun Trip. This trip will definitely lighten you up. Feel like you’re in the best of spirits when you indulge in this magic truffle. High Quality and Non-toxic. 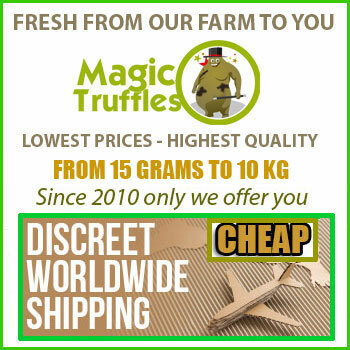 We produce only the best, high quality truffles possible. We want your truffle experience to be the best possible. We keep things 100% natural and organic. Great Low Price. Considering the quality of our showrooms, you’ll never find anything else so reasonably priced. Feel the lightning and the thunder course through your veins when you trip on the truffle. Intended for experienced truffles, the truffle experience is quite intense and will leave you feeling ecstatic. Take a walk on the wild side with the Dynamite; order now! I ordered these magic dynamite truffles for a first experience. I took 10g, it was 16:30. It is then that occur the first effect at 17h10 about, I start laughing uncontrollably for no reason! I was in my bed at that time continuing to laugh like a niez, here comes the idea of ​​going out to go in the forest that is about 100m from my home, this is not a dense forest because there is also a field with some trees and a vast space without trees with a table. The road is not far from this place, a few highways. I said that I had to walk to this place on a sidewalk, so next to a road has two voices, which, I said, is very busy. On the road, the sounds are strange, resonant, the walls and the road twist bizzarment. I arrive at destination, when going down the paths that lead to this place, I put my headphones and I start to go down these paths galloping like a horse. Arrived downstairs, I sit on the bench of a picnic table half broken and I enjoy the effects that continue to increase. About 16:40, I begin to explore the beautiful places, and I notice here and there packaging, cans, various waste ... That's when I curved the back and began to jump everywhere, shouting a shout wild animal, I think to be a magical creature species ... There is a ravine with a stream flowing, and the, a pack of cake that floats, it is then that thanks to my muscular legs, I jump and jattrape this naughty thing to examine it more closely, I observe it, feel it, and I put a lick to identify it! Yuck! I reject it by telling me that humans are disrespectful! I leave the ravine and go galloping. I sit down on a stone bench, I immediately raise it because it was cold! I feel it, I lick, and I conclude that it is evil! I walk away strangely (like a chicken) then I see a black dogs, it really existed except that I saw half-man! I try to run after him, to catch him, but I can not catch him .... around 18:30, I go home, still under powerful effect, not enough for my taste, I take the rest of the truffles when I come home, and I realize that my whole house is orange? From the ground to the ceiling ! In short, I spend the rest of my day tripping inside, looking at myself in the mirror, I saw that my pupils was dilated, to the point of not letting appear the color of my eyes! In any case, the visual effects are not intense, but for a first experience, was perfect! I also take this opportunity to note that Zamnesia's customer service is really professional! He manages all the problems and on top of that he is very friendly! Thank you very much for continuing to deliver your products in some countries! To buy with your eyes closed! Serious, competent and professional webshop and free shipping! great truflles. The magic kicks in after 30 minutes with good and strong visuals. Perfect with some base and drum.